Northampton is a small, charming rural town on the edge of the wheat belt. Registered as an Historic Town of importance in 1993 it is notable for three buildings of historic interest - Chiverton House (which is now the local museum), the Church of St Mary in Ara Coeli which was one of the many buildings in the Central West designed by the architect-priest Monsignor John Hawes, and the ruins of Gwalla Church, a true experiment in non-denominational religion built by the ex-convict Joseph Horrocks. 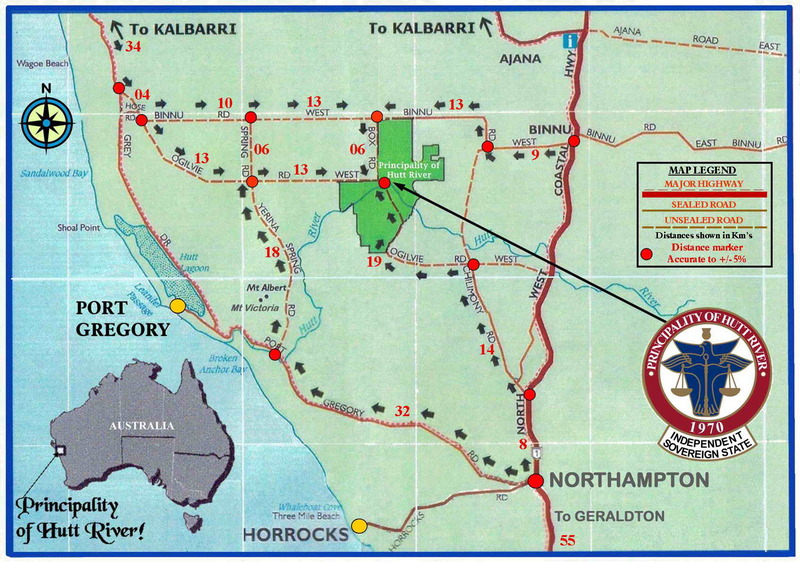 Northampton is located 465 km north of Perth via Jurien Bay and Geraldton. It is 51 km north of Geraldton. Northhampton was surveyed and declared in 1864. Its original name was 'The Mines' but the name was changed in 1871. No one is sure whether it is named after Northampton in England or as an honour to the then Governor of Western Australia, Dr. John Stephen Hampton. Or perhaps, a combination of both. Apart from providing information for visitors, the centre is located on the main street of Hampton Road in the former police station, quarters and courthouse (circa 1885) which was was constructed in Victorian Georgian-style. The stone and corrugated iron building housed the courthouse and police station for more than 80 years. The visitor centre is open Monday - Friday,9.00 am - 3.00 pm and Saturday, 9.00 am- noon. In summer (December - March) it is open Monday - Friday, 9.00 am - 2.00 pm. Located on Hampton Road, Chiverton House was built by Captain Samuel Mitchell, the manager of the Geraldine Mine, between 1867-1874. It is claimed that convicts built the building. If this is the case it must have been one of the last structures built by convicts in Australia as transportation ceased in 1868. Chiverton House later housed the local branch of the Western Australian Bank (1908-1912) and today it is the town's museum which combines interesting historic items in the building and a range of old farm machinery and vintage cars, as well as an old stables, two stone wells and a butchery, in the yards around the house. Chiverton Museum has a collection of unusual memorabilia including a fiendish attempt to produce a rolling shaver which looks like it would scar its victim for life. There are also some very interesting old kitchen utensils including a strange butter cutter. The museum's emphasis is on the unusual rather than the common place. It is well worth a visit. It is open from 10.00 am - noon and 2.00 pm - 4.00 pm on Monday, Wednesday, Friday, Saturday and Sunday. Check out http://northampton.com.au/index.php?option=com_content&view=article&id=64:museum&catid=52:museum&Itemid=71 for more information. The Church of St Mary in Ara Coeli was built by the famous Western Australian architect-priest Monsignor John Hawes. Located in Hampton Street, it was described in the Cathedral Chronicle soon after it was built: "As regards the exterior of the building, it gains character from the rugged nature of the hammer-dressed masonry, the deeply raked-out joints emphasising the charming and various colours of each stone. The main front of the church sheers up a precipitous cliff of rock: the effect of height increased by the long vertical lines of the massive buttresses springing upwards from the ground, and the soaring effect of the single deeply recessed arch. In the middle of this is set two light long mullioned windows with traceried head. The green tiles that cover the roofs give a very similar appearance to the green Westmorland slates of the north of England. Over the intersection of chancel and transepts rises a tall slender fleche surmounted by a silver ball and cross of wrought iron." Hawes saw the church as expressing spirituality in its soaring Gothic lines. Built in 1919, and located in Hampton Street, the Convent of the Sacred Heart is an impressive building which is listed by the WA Heritage Council. The Heritage Council website records: "In 1899 the Presentation Sisters succeeded the Sisters of St. Joseph in the Convent School. The Sisters lived and worked in very poor conditions until 1919 when the existing convent building was built. The convent building housed the sisters who ran the Day and Boarding School, which were in separate buildings. However, over the years their numbers declined until in 1983 the Presentation Sisters vacated the convent. Although demolition was considered, in 1984 the Northampton Parish decided to renovate the building, turning it into a camp centre. Several outbuildings of the original precinct have been demolished, including the dormitories, music room, boarders' dinning room, laundry and maids' room, old school and toilet blocks. Initially called the Irwin Centre after parish priest Mons. J. Irwin, the name was changed in 1989 to honour the sisters who no longer lived in the town." In terms of the Physical Description it notes: "Two storeyed stone building with surrounding timber verandas on both levels covered with a large corrugated iron hipped roof with vented gambrel ends. A large internal staircase provides access to the top floor, several rooms and the upper veranda. Generally access to most of the rooms on both levels is external via the verandas. The plan form is simple, being only one room wide to give good cross ventilation ... Although simple compared to Monsignor Hawes better known work, the building is another excellent example of his work and forms a significant precinct with his adjoining church." For more detailed information check out http://inherit.stateheritage.wa.gov.au/Public/Inventory/Details/ff36b531-8e9a-46f5-817b-a45d9c123462. Located in Mary Street, the Mary Street Railway Precinct is important because it is the last remnant of the first railway in Western Australia. It was constructed in 1912. The Heritage Council website (check out http://inherit.stateheritage.wa.gov.au/Public/Inventory/Details/84f11c1f-42c4-4768-a47a-2c6baec99303) describes the building as "a single rectangular room with stone walls and a wide, symmetrical cantilevered roof supported on gallows brackets. The roof is corrugated iron hipped at corners and with overhanging gambrels on each end. A rendered chimney with mouldings passes through the roof adjacent to the ridge on the south end of the building. Doors are pairs of two panel French doors with 2 pane highlights over, on two sides of the building together with double hung windows. High above the windows under the eaves and all around the building are large grilled vents between stone piers that ventilate the roof space over a flat ceiling. The ceiling is plasterboard with timber mouldings across the joints. The building's authenticity and integrity is enhanced by the original internal fittings, fireplace and furniture which are still in place. The character of the simple timber framed weatherboard rest room is enhanced by its curved corrugated iron roof which is cantilevered out on awning brackets to the west to form a veranda. The curved roof gives it a railway carriagetype charm. The railway platform, on which the buildings stand, is still in good condition making this site the focal point of the overall railway precinct. The precinct also includes the Station Master's residence to the east." Today the precinct has displays of railway memorabilia and rolling stock. Located south of the town (turn east off Hampton Street at Gwalla Street) are the cemetery and ruins of the Gwalla church which was built by Joseph Lucas Horrocks, a convict who was sentenced to 14 years transportation for forgery and arrived in Fremantle in 1852. In Fremantle he worked in the medical section of the convict settlement and, due to a chronic shortage of medical officers in the colony, was appointed medical attendant for the new settlement of Port Gregory in 1853. He was given an unconditional pardon in 1856 and spent the rest of his life (he died in 1865) working in the Northampton-Champion Bay area running a store, agitating for improved conditions for convicts, and building the Gwalla non-denominational church (it had separate Anglican and Nonconformists pulpits and a reading desk for anti-ritualists). Horrocks is buried in the cemetery. There is detailed information about the church and the ruins at http://inherit.stateheritage.wa.gov.au/Public/Inventory/Details/9e3f2849-b3c6-4a90-b31c-5f7d43d010fc. Of particular interest is the fact that the church "had a choir loft and was fully furnished. The first service at the Gwalla Church was held on 4 October 1864. To emphasise that no denomination had prior right to the use of the church Horrocks had the following words from Isaiah inscribed on the wall: "Thy house shall be called a house of prayer for all people". However, with the establishment and development of the township each denomination built its own church. After fifty years continuous service the Gwalla Church was no longer in use and the last regular service was held in 1913. It was then decided to divide the church furnishings among the different religions. The bell was eventually moved to Perth's Wesley Church and the church fell into disrepair." There are some Aboriginal art works on the sheltered overhangs on Bowes River Road. They can be found by turning south off the Horrocks Road 30 km west of Northampton. The area around Northampton is known as one of the state's premier wildflower districts. The local website notes: "Northampton boasts a wonderful array of beautiful and colourful wildflowers in season including exquisite orchids such as the donkey, bee, cowslip and the rare greenhood orchid. Spectacular fields of pink everlastings and yellow pom poms are easy to find amongst the Northampton countryside and the sand-loving Kangaroo Paw can also be found here. These are just a few of the magnificent range of wildflowers you will find when visiting the Northampton region. "The more popular wildflower spots are the Yerina Springs Road, West Binnu Road and Ogilvie sandplain, 25 kms North of Northampton. Or head South to Oakabella or inland via the Chapman Valley Road to see a diverse and vivid exhibition of wildflowers in bloom." When planning a trip there are a number of very simple rules to follow so you can see the wildflowers at their most spectacular. (2) There is a tendency to say "But I won't know what I'm looking at" but that is rubbish. There are a number of great books and the best, by far, is the answer to "Wildflowers for Dummies" titled "Colour Guide to Spring Wildflowers of Western Australia". It is privately published by Wajon Publishing Company, written by Eddie Wajon, and comes in three volumes – 1. Kalbarri and the Goldfields, 2. Perth and the Southwest and 3. Esperance and the Wheatbelt. They can all be purchased online from Kings Park & Botanic Garden in Perth. Check out https://www.aspectsofkingspark.com.au. Morowa also publish a leaflet titled "Morowa Wildflower Drives" which, if you were thorough, could keep you in the area for a couple of days. Located north of Northhampton (there is a map which can be downloaded at http://www.principality-hutt-river.com/visitors/PHR%20Location%20Map.jpg) is the infamous Hutt River Province, the unassuming home of Prince Leonard and Princess Shirley of Hutt. This amusing episode in Australian eccentricity resulted when Prince Leonard renamed his wheat farm the Hutt River Province, declared himself a prince and his wife a princess, seceded from Australia and Western Australia and, as a nice little earner, started printing his own stamps. Of course none of his grandiose ambitions had any validity but he did attract an inordinate amount of publicity. They now have a wide range of souvenirs and encourage visits. Check out http://www.principality-hutt-river.com/ for comprehensive details. * Northampton was first settled in the late 1840s after Lieutenant George Grey had passed through the area on his retreat from North-west Cape. * Exploration in 1842 led to the discovery of lead ore and copper which were subsequently mined at the Geraldine and Gwalla Mines. The Geraldine Mine (located about 5 km west of the town) was reputedly the first lead mine in Australia. * By 1863 980 tons of lead and 230 tons of copper were being exported from the district. * The town was surveyed and gazetted in 1864. * Its original name was 'The Mines' but it got its present name in 1871 as a combination of Northampton in England and an honour to the then governor of Western Australia, John Stephen Hampton. * By 1877 the district was producing about 4000 tons of lead and copper each year. The minerals were moved to Port Gregory by wagon. * In 1879, after considerable local pressure, a railway was completed from Geraldton to Northampton. It was the first government-built railway in Western Australia. * The town was seriously damaged by floodwaters in 1900. * The Convent of the Sacred Heart was opened in 1919. * In 1936 4,628 tons of lead were mined in the district. * In 1936 the Church of Our Lady in Ara Coeli was consecrated. * The Grand Junction Mine was closed in 1938. * In 1954 the Northampton State Battery was officially opened. * The railway was finally closed down in 1957. * In 1970 Leonard Casley established the Principality of Hutt River in the shire and declared its independence. * In 1993 the town was classified by the National Trust as an historic town. * The Northampton State Battery was closed down in 2010. Northampton Visitors Centre, Hampton Road, tel: (08) 9934 1488. The local shire has a useful website. Check out http://www.northampton.wa.gov.au and http://www.northampton.com.au. The Arty Tarts recently initiated a big community art initiative called EWETURN Around which was to encourage visitors to think about turning around and stopping in Northampton The project involved creating 30 life-sized sheep made of fibre glass and gaily decorating them in all manner designs and colours with the idea to have the sheep take up permanent posts at various spots throughout the town. The whole community got behind the initiative and turned out in force to celebrate the presentation of these sheep to the community.Indeed art and craft seems to permeate the lives of the Community and is alive and well and a vibrant and happening feature of community life in Northampton and truly deserves mentioning.